There’s a lot more to the oasis town of Pushkar than just the Camel fair that it is mostly associated with. Walk through the labyrinth of alleys and lanes, its bazaars and the ghats to discover the magic of this tranquil town. Below are a few things I love to do when I am in Pushkar. The aura around the lake, the reflections of the evening colors of setting sun and the music flowing around all adds up to making a memorable evening. Spending an evening at Pushkar lake always fills me with energy. Sip hot coffee by the lake side andatch the day bidding adieu and a beautiful evening taking over. As the golden sun dips behind temples, lake water mirrors the changing hues of the sky from blue to orange and then red and slowly black takes over transforming the day into a beautiful night. Spend some quiet hours sitting on the stairs of the lake listening to the music coming from all directions - hymns and bells from the temple, nagara beats from the ghat, strumming of guitar from some cafe and sound of Ravanhatha being played by some bhopa musician sitting just next to you. While you are lost in the music, the lake turns gorgeous with reflection of town lights and numerous stars. I love watching the day end by the lake side and being just with me; slowly pilgrims leave temples, tourists go back to the market or the hotels, sanyasis go hiding into their kutiya and you are left alone on the stairs gazing at the glittering sky and the lake. The calm cool air from the lake fills you with tranquillity. Riding through the desert atop a camel is an amazing experience. I love to have a chat with enthusiastic camel men who are always happy to share their stories. If you want to know about the life in a desert village, he is the best person to talk to. Hear the stories while sitting 10 feet above the ground sailing through the desert. The slow moving camels will take you through dunes to a point from where you can watch beautiful golden ball dipping down beyond the horizon and the sky changing color from evening red to violet and then slowly darkness engulfing the whole expanse. You can hire camels from the fairground or can ask your hotel to arrange for one. There is an option of camel cart too if you want to enjoy the ride with your friends or family. The best time to go on the safari is before the sun sets. If you are in Pushkar around the fair you must take a balloon ride. I love to glide gently above the crowd over the vast expanse of the dunes to get an amazing bird’s eye view of the fair and the desert. The balloon ride is usually organised towards the end of the fair. The best time to take a ride is at sunrise when the soft rays of sun slowly lit the temples, ghats and the ancient buildings surrounding the lake. It’s an once-in-a-lifetime experience and capturing it all in morning light is a dream-come-true for any photographer. Advance booking is recommended to get the best time slots. Ajaypal ji temple is located 10kms from Pushkar. Raja Ajay Pal, the founder of Ajmer City, founded this temple in 11th century AC. The temple is surrounded on all sides by boulders of marble which makes the site amazingly beautiful. I find the drive to Ajaypal ji one of the most scenic drives around Pushkar. It passes through the forest for initial 3kms which is replaced by the sand dunes and then the valley surrounded by the hills. I like to stop and spend some time with simple villagers talking and clicking. Most of the times when I do so, I am offered tea and local snacks. A mud house, huge veranda, a well, giggling kids, smiling ladies in their vibrant attire busy with house chores and cattle is what a typical home will comprise of. And men folk with colourful turbans can be seen sitting on a platform below a tree having hookah and chatting. Rent a motor bike or a scooter from Pushkar market; look for the Bitumen road leading from the base of Savitri hill that takes you towards Kharekdi village. This road leads you to Ajaypal ji Temple. Rainy season (August- October) is the best time for this drive when the greenery is at its best and you can see springs, streams and waterfalls all through the drive. Evening aarti is a not-to-miss experience for everyone, believer or non-believer. People in thousands assemble in the temples across the ghats. As the chants begin the atmosphere gets filled with the fragrance of incense sticks and roses. The sound of ringing bells comes in chorus from numerous temples surrounding the lake. The whole ambience feels divine and transports you to a different world altogether. While the evening sky fills with gold of setting sun, the lake looks gorgeous with numerous floating diyas. You can attend aarti ceremony at any of the ghats but evening aarti at Varah Ghat is highly recommended. It commences at 7:00 pm during summers and 5:30 pm during winters. Music is in the soul of Pushkar. While strolling around the lake in evenings, you can find many people learning and playing their favourite instruments. Around Gangaur ghat, look for coke-studio-fame Nathu Lal Solanki, the master drummer teachiing the beats to drumming enthusiasts. You can join him and learn to play these local drums called Nagara. He still charges a negligible amount that he used to charge some 20 years back To teach Nagara. He considers this place his karmabhumi from where he has achieved the name and fame and it’s his tribute to the place and the art. Do hike up the Ratnagiri hill in south-west of the lake if you have time. It’s a moderate hike of around 1.5kms and takes around two hours to reach the top. Located on the top is Savitri Devi Temple dedicated to the wife of Lord Brahma. The breathtaking panoramic view of Pushkar town from here is worth the effort. Evening hours are best for this trek as you get an amazing sunset view from the temple. Go for a good retail therapy session once you are done with all other planned activities. 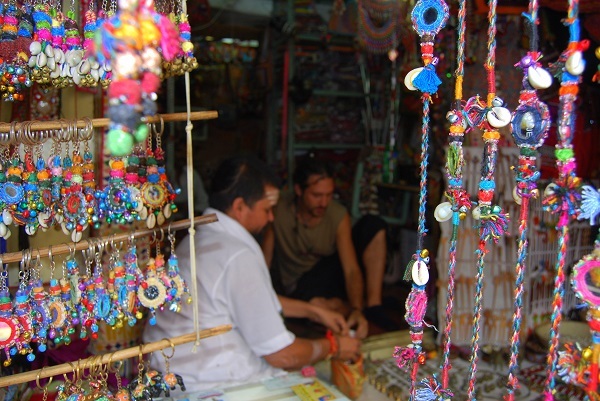 A good mix of ethnic and hippie culture reflects in Pushkar market. There’s a lot to shop for, so keep at least half a day exclusively for shopping. Pushkar is known for its traditional silver jewellery, ethnic clothes, leather bags and rose products. T-shirts, harem pants, wrap-arounds, kurtis, bandhanas and funky accessories are also available in abundance at a very reasonable price. Do not forget to bargain to get the best prices. You can also shop for souvenirs like puppets, antique silverware or pottery stuff. The main shopping places are Baza Bazar, Sarafa Bazar, Sadar Bazar and Kedalganj bazaar. Pushkar is heaven for foodies with a range of roadside restaurants, rooftop cafes and eateries serving wide variety of food. Some of not-to-miss foods in Pushkar are malpua and kachori at Sarweshwar at mithai wali gali, Gulkand Lassi near the steps of Brahma Temple, lafa and falafel at Ganga restaurant near Rangji temple, muesli and fresh fruit juice at Sonu juice near bus stand and pizzas at La-pizzeria. Pushkar is such a place where you can spend days just having good food and relaxing in cool cafes. Some of Pushkar’s most popular cafes are Honey & Spice, Funky Monkey Cafe and Out Of The Blue Cafe. The best way to unwind after a fun filled day is to enjoy the Kalbelia dance performance. It is one of the most sensuous dance forms of Rajasthan performed by lively Kalbelia tribe, a nomadic community who were snake-charmers until it was outlawed by the Wildlife Protection Act of 1972. With their charm, unbelievably flexible serpentine shimmying and their lovely traditional black attire they have the talent to absolutely mesmerise you. The beats and the movements will surely instigate you to join them in their dance. Many hotels arrange the dance performances in their premises for their guests. And if you want to experience it all with the experts, you might want to join the group trip PULSATING PUSHKAR with Indian Terrains.